World’s most popular pet, Cats have been associated with humans for at least 10,000 years. As compare to dogs, there isn’t as much variety of cats. According to the Cat Fanciers’ Association, there are about some fifty officially recognized cat breeds. Today, we come up with a list of some unusual cats who have truly unique appearance. Yes, the following are 10 of the most bizarre cat breeds – but you’ll agree that they’re still totally lovable in their own unique ways. Read on to meet 10 of the world’s most bizarre cat breeds. The Japanese Bobtails are one of the most bizarre cat breeds in Japan and Southeast Asia. They are born with a rabbit-like puff tail, and some will even hop like rabbits, rather than running! The Japanese Bobtail is well-known and very popular in Japan for centuries, and it frequently appears in traditional folklore and art. The Japanese Bobtail is medium-size and slim, though well-muscled. As its name suggests, the most striking feature of the breed is its short tail, which is about four inches long – though it curls into a corkscrew shape, making it appear even shorter. Like the American Curl, the Scottish Fold takes its name from the unique shape of its ears. It seems that it hardly has any ears at all and has an owlish look!, which is intensified by its large, round eyes. The Scottish Fold is recognized by its medium-size body and unusual ears, which fold forward and downward, and are quite small. The Fold’s ears look straight and normal at birth, but will begin to fold after about 21 days. Most Folds also have short, silky hair, although there is a long-haired variety as well. They are generally friendly, cuddly cats, and don’t mind other pets. The American Curls resemble your everyday cat in all ways except for one detail: the unique shape of their ears, which curl back from the face toward the center of the back of the skull. Initially, a Curl kitten looks like any other kitten, though with large, open ears. Within a week their ears will curl back, curling and uncurling until the cat reaches four months of age. Their curl will then become fixed and permanent. 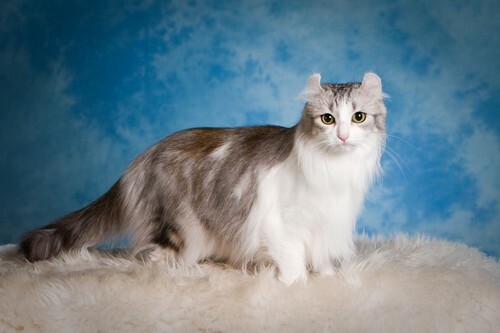 American Curl, being one of most bizarre cat breeds, is found across the world in the United States, Spain, France, Japan, Russia, and many other countries. 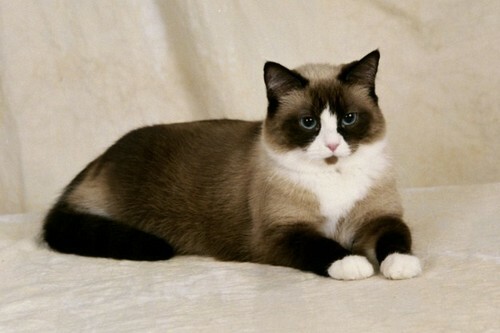 The Snowshoe is one of most bizarre cat breeds that originating in the United States of America in the 1960s. Despite having existed for 53 years, Snowshoes are rare due to the difficulty of reproducing the correct coat markings. Snowshoes are generally affectionate, sweet-tempered, and mellow. They enjoy the company of humans and being pet, and are compatible with children and other pets. Snowshoes are very social and docile, and show great devotion and love towards their owners. The Khao Manee cat is Thai for “white gem,” indicating this breed’s white coat and jewel-like eyes. Known for their high cheekbones, granting their faces a striking appearance, Khao Manee is a rare breed of cat, which has an ancient ancestry tracing back hundreds of years. They are pure white with a short, smooth, close-lying coat. They can have blue eyes, gold eyes or odd eyes with one of each colour. The odd eyed Khao Manee is the preferred variety. They are muscular, athletic cats of moderate foreign type and are reputed to be active, communicative and intelligent. The breed is sometimes also called the Diamond Eye. The Persian is a large to medium-sized cat, with a well-balanced body and a sweet expression on its face. It has a huge and round head, small ears and a comparatively short tail. Its name refers to Persia, the former name of Iran, where similar cats are found. The breed was originally established with a short (but not non-existent) muzzle, but over time this feature has become extremely exaggerated, particularly in North America. The Ukrainian Levkoy is a cat breed of distinct appearance (dog-face appearance), having inward-folding ears and little to no hair. Having similarty to the Sphynx in some ways, the cat is of medium size with a longish body, appearing both muscular and slender. It has soft, elastic skin; an excess of which leads to a wrinkled appearance. The Ukrainian Levkoy is still relatively new as a breed. The first official specimen was born in January 2004. They are created by crossing or by outbreeding hairless Donskoy females with Scottish Fold metis males. 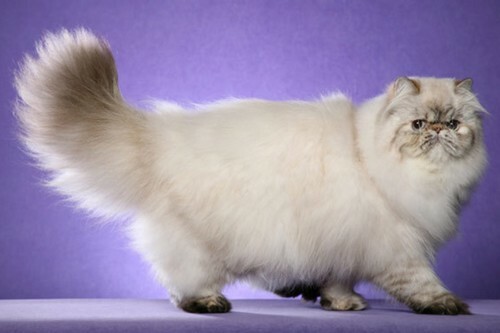 Minskins are one of a set of most bizarre cat breeds known as “dwarf breeds”. 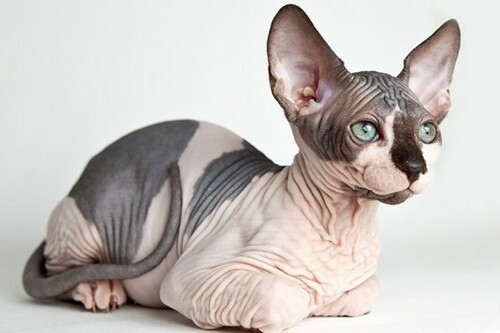 They are derived from crossing the Munchkin with the Sphynx. They appear simply to be incredibly small Sphynx cats, and require the same grooming. The Minskin is an incredibly new breed, and has only been around since 1998. The first standard Minskin “TRT I Am Minskin Hear Me Roar” ‘Rory’ was born in 2000, and by 2005, there were fifty of them in existence. The Munchkin is a relatively new breed of cat characterized by its very short legs, medium-size with a long body, walnut-shaped eyes and triangular ears. The cat has similar characteristics to normal domestic cats. It is generally described as a sweet-natured, playful, people-oriented, outgoing and intelligent cat which responds well to being handled. The shortness of their legs does not seem to interfere with their running and leaping abilities. The cat comes in all coat colors and patterns. 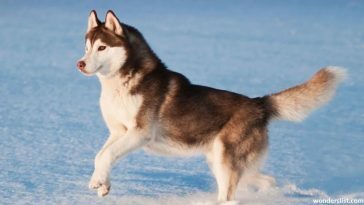 It also comes in short-haired and long-haired varieties, both sporting an all-weather coat. The Sphynx, or Canadian Hairless, is probably one of the best-known bizarre cat breeds. It is a breed of cat that is born without fur. Depending on your point of view, it’s either a charmingly exotic or a slightly creepy looking breed. It is actually covered with a fine gossamer-like down which can only barely be felt or even seen by the naked eye. Because of its fineness, the skin of the Sphynx is often compared to warm suede. Whiskers and eyebrows may be present, either whole or broken, or may be totally absent. Another bizarre trait of this breed is its wrinkles. Around the shoulders, between the ears, and around the muzzle is where the wrinkles should be heaviest. The cat display a high level of energy, intelligence, curiosity, and affection for their owners.